Almost three months ago Google released Android 8.0 Oreo, but currently there are just 6 million of the world’s Android devices on that version. The struggle continues to get a large number of Android devices onto Oreo (or even Nougat) while releases from 2015 and 2014 continue to dominate. 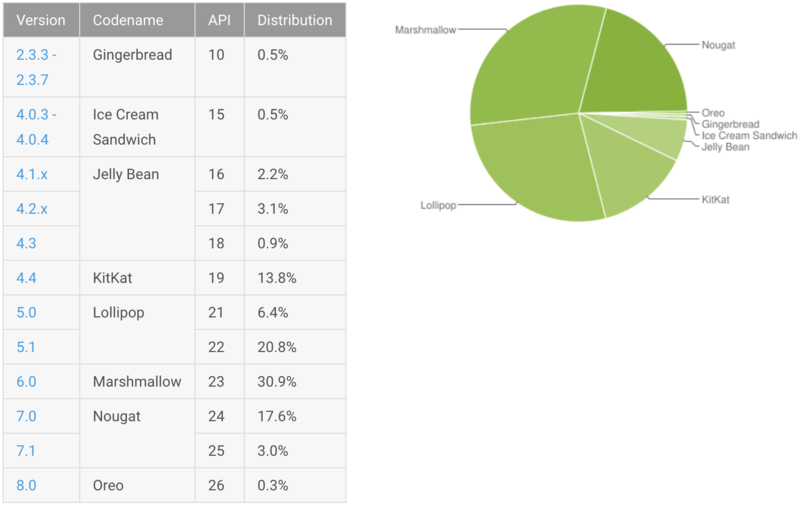 The Android distribution numbers for November 2017 are in, and they don’t reveal anything new or unexpected. Trends that we picked up on in September and October are still moving forward. Oreo can’t gain any traction, Nougat gains solid footing a year too late, and Marshmallow remains the most popular version of Android despite being two years old. None of it is positive for Google, frankly. These results just reinforce the topic of fragmentation that has long plagued Android’s image. Oreo and Nougat rose since last month as, fortunately, every other version of Android stumbled. The problem, however, is that the gains for the two most recent versions aren’t very significant. Although Nougat was able to rise by nearly 3 percent, Oreo crawled up just 0.1 percent. The Pixel and Nexus devices are joined by the LG V30, Sony Xperia XZ1, and Xperia XZ1 Compact as the only hardware offering Oreo. Based on the 2 billion monthly active users on Android confirmed in May, it would seem Oreo and Nougat are on at least 418 million devices globally. The majority belongs to Nougat, though. An acceleration in Marshmallow’s decline should give Google the tiniest bit of confidence. Because it was optimized for devices with mid-range and low-end specifications, a massive number of hardware manufacturers found success in 2015 through Marshmallow. But, after two years of dominance, it does look like Marshmallow is on its way down from the lead. It’ll just take a very long time for another version of Android to claim first place. Google’s long-term solution for fragmentation, known as Treble, will be present for all phones and tablets that ship with Oreo out of the box. We’re looking at an incredibly long wait before we reach a time when Apple can stop making fun of Android’s fragmentation. Of course that’s because Apple controls both hardware and software for its products, but Google should absolutely be jealous that its partners have failed to remain on top of software updates despite years of encouragement and assistance.